Kaolin is the most valuable component of the Newnes Junction deposit. 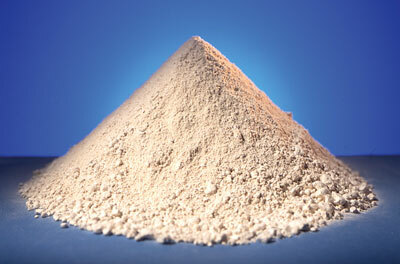 Kaolin is a near-white clay, predominantly composed of the mineral kaolinite. Its chemical composition is Al2Si2O5(OH)4 (hydrous kaolinite). For many modern industrial applications, kaolin must be extensively refined and processed (mainly water-washing, delaminating and calcining) from its original state to obtain important, required commercial characteristics. After beneficiation, kaolin ranks as one of the most valuable of the industrial clays. The Newnes Junction kaolin occurs as a matrix within quartzose sandstone, and averages 7.6% by volume with individual zones exceeding 15% concentrations. The kaolin has been formed on site by ground water alteration of detrital feldspar and other clay minerals, such as illite, and as a result, has recrystallised into a homogeneous, well-ordered, crystalline platy kaolinite, exhibiting superb industrial properties. There are other deposits of kaolinite sand/sandstone deposits elsewhere in the world (e.g. Europe), where, like the SCM resource, the host sand is a valuable co-product. In comparison to other clay minerals, the kaolin from the Newnes Junction deposit has a range of unique optical, physical, and a compositional properties that makes it ideally suited for a broad selection of industrial uses. These properties (Kmentoni, 1986) are summarised below. • Partially-calcined (at 750-800°C) kaolin with its high brightness is used as a paper filler and coater (in the form of Metakaolin) and replaces expensive TiO2 as an opacifier. • Uniform particle size and homogeneity is necessary for optimum use in plastics, paint, and rubber as functional fillers, improving the tensile strength, electrical properties, and dimensional stability of finished products. • Low alkalis and low iron are necessary chemical properties for the production of Metakaolin, a cement pozzolan. • High PCE, combined with suitable chemistry, i.e. low alkalis and low iron, are necessary ingredients for the production of refractory kaolin. • Main whiteware ceramic markets include sanitaryware and glazes, utilising the higher grades of kaolin. • Excellent additive in mix for bricks, tiles, and pavers to produce a range of pastel coloured products. The kaolin additive, known as "white-firing clay", is currently in short supply in Sydney. • Unrefined kaolin is used in traditional ceramics such as floor and wall tiles. 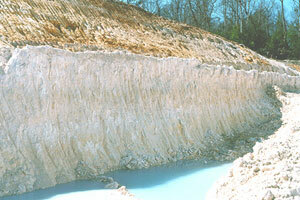 World production of kaolin in 2002 was an estimated 24.6 Mt with an annual growth rate of around 1.75%. Overall demand for kaolin is forecast to grow at a rate of approximately 2% pa to attain some 27.7 Mt in 2010. Kaolin is produced in over 60 countries, and in most cases, output is relatively small. Processed production only exceeds 1 Mtpa in the USA, UK, Brazil, and probably China. The majority of kaolin is consumed close to where it is produced, but there is a substantial amount shipped over large distances. Apart from supply and demand, the main factor affecting the price of kaolin is the cost of processing. The costs incorporated into SCM's cash flow model are based on processing in a conceptual plant designed by mineral processing engineers engaged by the Company. There are six main kaolin producers in Australia, mainly supplying the local market. A period of consolidation of ownership has led to Unimin (part of Sibelco, Belgium) emerging as a major domestic producer. Australia currently produces close to 155,000 tpa. Kaolin occurs in all states of Australia with major deposits in WA, NSW, Qld, and Vic. There are very large resources of kaolin in WA and SA but the lack of water of suitable quality (mainly high salt levels) for processing has been a consistent impediment to the development of these deposits. Several of the deposits are in remote locations resulting in prohibitively high costs of transportation (e.g. Broome, Skardon River). Victoria has a significant (200,000 t) kaolin resource at Axedale, with an open cut mine producing 50,000 tpa of ball clay, suitable only for the ceramic white ware industry. At the Lal Lal and Pittong deposits near Ballarat, Imerys Minerals Australia (formerly English China Clays) produces around 60,000 tpa of kaolin used mainly for paper coating. Cape York Peninsula has been the focus of active mining development of kaolin deposits since the late 1990s. The Weipa operation by Comalco ceased production in 1996, exploration is ongoing by Cape York Kaolin south of Weipa, and Minerals Corporation, the owner of Skardon River Kaolin, operating in the same region has experienced technical problems with processing and is still attempting to commercialise this operation. It plans to export calcined kaolin to Europe and Asia. Unimin Australia is the largest producer of kaolin in Queensland from its recently acquired Kingaroy deposit, where it processes crude kaolin, dried pelletised, and bagged for general use, and produces a delaminated kaolin for paper coating. South Australia is a small producer of kaolin mainly used in cement manufacture and industrial fillers. At Williamstown, a mixed sillimanite-kaolinite product (Kaosil) is used for the manufacture of refractories and insulators (<3,000 tpa). Kaolin in NSW is currently sourced from Gulgong, and is used mainly for ceramic and filler grade products. Altogether, the Gulgong plants have a combined production capacity of 40,000 tpa. It is apparent that current production is becoming sub-economic because of excessive overburden thickness, with kaolin restricted to deep pockets only. Additional sources of kaolin are in the Southern Highlands area around Marulan and Windellama, where individual small pockets of kaolin are mined for the bricks, tiles and pavers industry to produce light coloured products. The huge advantage of the SCM kaolin resource is its outstanding industrial properties, which make it suitable for a wide range of industrial applications. Its source will be in the Western Sydney area as a co-product of washed friable sandstone. Processing facilities will be located within industrialised Western Sydney on a rail facility for export and interstate distribution and adjacent to a source of non-saline water for processing. The Newnes Junction kaolin resource fits the motto for a successful industrial mineral project "BIG, WHITE, AND CLOSE TO MARKET". The deposit has a resource of approximately 2 Mt, a beneficiated brightness of ~93/100, and will be located virtually in industrial Western Sydney. As with Specialty Sand, industrial uses of Kaolin depend on its purity and physical characteristics. Applications for which the SCM intends the Newnes Junction Kaolin include metakaolin, plastic filler, rubber filler, refractory clays and Chamotte, glass fibre reinforcement, ceramics, platerboard filler, and as a brick and tile additive. Following is a summary of these Kaolin derivatives. • Brick and Tile Additive.